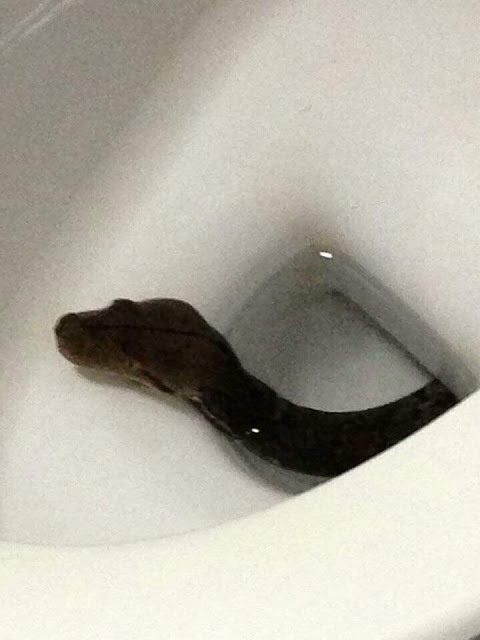 Huge snake suddenly pops out of the toilet and bit him! Shocking! Home / Life / Huge snake suddenly pops out of the toilet and bit him! Shocking! It is for real that the internet is filled with a lot of silly and quite surprising stories. Another story is now circulating online and has been leaving the netizens terrified! A Facebook user named Jonjon Joson posted a photo of a snake inside a bowl and another photo that shows the blood running down his legs. In a Facebook post, he revealed that he was sitting on their toilet when he suddenly felt an extreme pain in his private part. A few moments later, he saw the blood running down his legs. He tried asking for help but then he was stunned when he saw the huge head of a snake in their toilet bowl. He claims that he shared this experience to warn everyone to always check your toilet before doing what you have to do.